You may have seen my recent discussion about Serious Topics in Books and I definitely think this is one of the toughest topics to deal with in YA. Although, it's definitely worth the read, especially since the sequel has just been released! Alice Tully knows exactly what happened that spring day six years ago, though it’s still hard for her to believe it’s real. She’s making a go of things, putting all that behind her at last- but Alice’s past is dangerous, and violent, and sad, and it’s about to rip her new life apart. ‘Looking for JJ’ was a thought-provoking, powerful and at times controversial read that explored a topic we continuously hide from, and attempted to answer a question we never know the answer to, “Why would a child murder another child?” Writing about a tough-topic, Anne Cassidy executed Alice Tully’s story brilliantly, with a simplistic writing-style that was emotional and moving. This book was not only bold and brave, but was a tough and tragic read. I applaud Cassidy for the way she never focused on the crime, instead building her story about grief and guilt, and whether Tully deserved to live the life she had. This character-development at the beginning really helped the story as it moved into looking at what happened six years ago at Berwick Waters. If the story had been told differently, I’m not sure we would have cared about Alice as much as we end up doing so. Never did I think I would be able to empathise with a murderer. Never did I think that, when I picked up this book, I would connect to a character like our main protagonist Alice Tully; and I was soon proved wrong. In the novel, Alice refuses to think about the past, and what events took place there. She doesn’t want to look back and re-live what she knows will make her feel overwhelmed with the guilt of what she’s done. Cassidy writes Alice in a way that makes her so real, with the fact that she wants the every-day life we all live – or may want to live in the future. With a boyfriend, a job, and a place in University, it’s what you would want for yourself. Even so, with flash-backs to the past that tell her story, this was nothing except honest and raw. You would expect to hate – understandably – Alice Tully, although you don’t. Instead, you understand that she was unlucky. That she was, and still is searching for exception, and no matter where she hunts for it in her past, she can’t find it. When our main-character does have it though, she becomes desperate; and she won’t let go. Like I mentioned before, you realise that she is not the same person, and wonder if people can change. I’ve read so many books where the character has felt no remorse for their actions, and have been oblivious to having done anything wrong. It was refreshing to see emotion, and regret. Although not perfect, this book is heart-wrenchingly truthful. Cassidy, I’m glad to say, is not one that hides from difficult topics, and really making you think about them; neither is she scared of making us question ourselves, or teaching us a life-lesson we’re never going to forget. With an idea such as this, you have to take into account that this has, at times, been reality. The author doesn’t want the excitement that comes from an episode of CSI, instead we keep reading because we want to know, “Who is Jennifer Jones?” and “How did this all happen?” as, finding out who she is turns out to be quite the surprise. I won’t say that this wasn’t a page-turner, because that’s exactly how I would describe it. Despite the tension slipping at some parts of the novel, the time where I wanted to get to the next chapter, I thought that overall, the flash-backs were so interesting, and the plot itself was strong. A slightly slow few chapters in the middle was made up for by a captivating-ending, where you see the side of humanity that changes their perception of somebody within minutes. 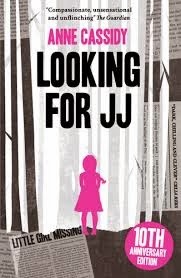 This book was published ten years ago, and because of the recent release of the sequel, "Finding Jennifer Jones" I was provided with a copy of this book, for review, by Harper Collins and Hot Key Books. Do you like books that handle tough-topics? Yay so glad you enjoyed this! I thought it was written really well and am excited to read the sequel.